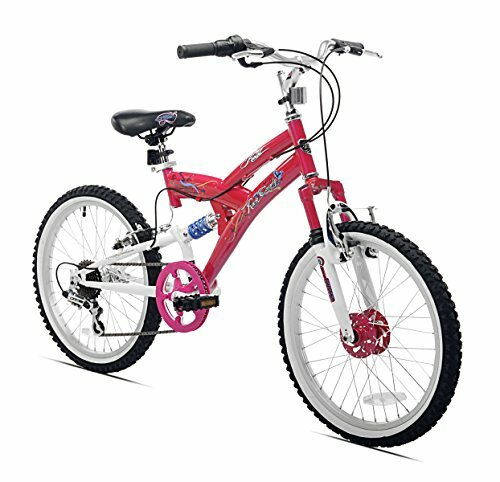 The Kent Rock Candy Bike for Girls is a very petite and stylish bike built with feminine characteristics. It is constructed with features that an adult bicycle offers yet meant for young bikers. It comes with a double suspension frame that offers a smooth ride on uneven and rough terrain, a seven speed twist grip shifters for a seamless and efficient gear changes, a V-braking system with levers made from alloy offering a controlled and powerful stopping force, and other high quality components, put together to form a very comfortable and durable leisure bicycle. The seat comes with a quick release clamp made from alloy to offer proper positioning for a comfy ride. This bike is secure, sturdy, and highly responsive and will stand the test of time. A massive twenty inches alloy wheels offering superb traction and support. A seven speed gearing system employing a responsive twist grip shifters for coordinated gear changes. Sturdy Frame with a double suspension for a smoother ride irrespective of nature of terrain. Bike is lightweight yet tough for better handling and control. The Kent Rock Candy Bike for Girls is a sweet little and pretty bike that is sturdy and stylish, yet pocket friendly. It comes partially assembled and the instructions are a bit complicated with lots of technical terms that may be confusing for a novice thereby making it a pain to assemble it yourself. To save yourself the stress, you can take it to a bike shop for proper assembly and tuning. The bike delivers nice performance and smooth operations. Note that foot brakes are not installed on this bike; instead it uses handbrakes which are likewise easy to use and delivers enough stopping power. The twist shifters also deliver silent and controlled gear changes that make you feel like a professional. The double suspension system of the bike is superb as they take on bumps of various sizes and shapes with relative ease. This bike offers pure fun for junior girls and with the feminine designs, lovely and colourful paint scheme and touches, it offers a good value for money and comes highly recommended if you want to please your girl without stressing your wallet.